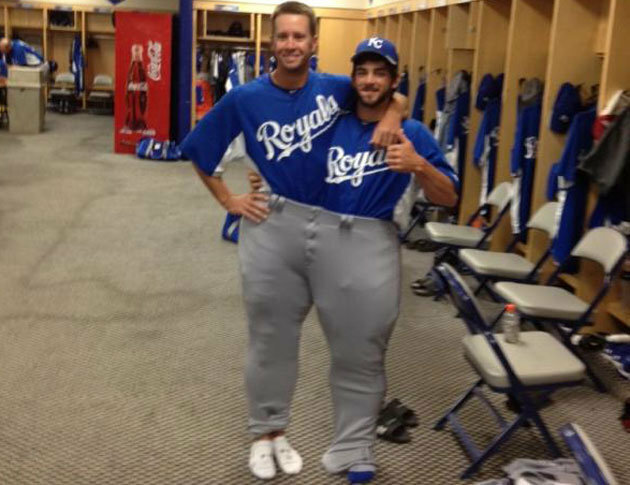 This is a picture of Tim Collins and Everett Teaford fitting into one pair of Jonathan Broxotn’s pants. Collins is 5″7, 170 pounds. Teaford is 5″11, 157 pounds. Broxton is 6″4, 300 pounds. Jonathan Broxton was traded mid-season. I hope his pants were too. Those are some huge pants. I don’t know who Everett Teaford is.